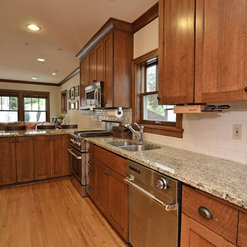 Opened the back end of our house off the kitchen to create a large breakfast area and family room in our 1915 Craftsman Minneapolis home. 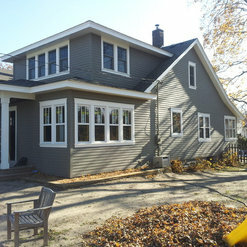 Kuechle Construction was able to handle all the challenges of working on an older home, and made a seamless transition into our new space complete with matching trim and all finishes. Through out the job, workers were on time, managed dust very well, and made it as easy as possible to live in our home as it was being worked on. Work was completed on time and within our budget. I would use them on our next project and recommend them to anybody. 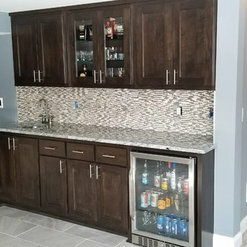 I hired Kuechle Construction to complete a kitchen/center island renovation in 2018. My expectations were met and the quality exceeded that. The communication was excellent and issues were resolved almost as fast as they came up. 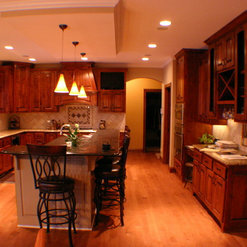 I would recommend Kuechle construction to any homeowner looking to complete a renovation without all of the hassle. After working with other contractors on past remodeling projects, we hired Kuechle Construction to upgrade our drafty wood-burning fireplace. Andy Kuechle provided exceptional communication and project management, finding solution after solution as we wrestled with challenging dimensions and the “handiwork” of prior DIY-happy occupants. Despite multiple adjustments, Andy saw to it the project was finished on time and on budget, and we now have a gas fireplace insert and Kuechle-designed surround and custom mantel that we use all the time and absolutely love. 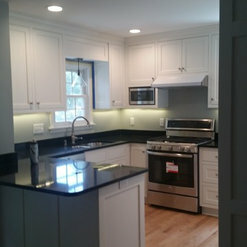 The finished product and overall experience with Kuechle Construction truly exceeded our expectations. Highly recommended. I purchased a home in New Hope to remodel & sell. Having worked with an architectural firm for 16 years, I looked to them for a contractor recommendation to do the extensive remodeling. Kuechle Construction was the right contractor to do this work. I wasn’t looking to just “flip” the house. 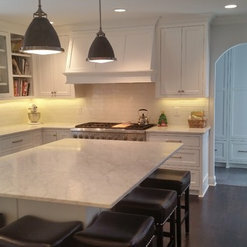 I wanted quality finishes and workmanship, which Kuechle Construction delivered on. One thing that was important to me was having the Owner, Kevin Kuechle, be on-site for quality control. 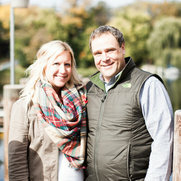 The project came in on budget and the timing was perfect, completing the project to coincide with the spring market. The finished product was truly something I was proud to put on the market. Caring and respectful crew it’s nice to have a crew come in and care as much as I do about the appearance of my home even under construction. Andy was polite and had great finishing ideas to my project to give it the accents I had originally missed. The crew is knowledgeable and takes pride in their work which shows with the quality of materials they choose and use. Great attention to detail and great attitudes can’t wait to have them help with our next big project. I was absolutely pleased with the work that was done by Kuechle Construction. My husband and I had just bought a house and needed some work done on the new house (bathroom remodel, and a few other side projects). They worked quickly, and if we had ANY questions at all never hesitated to take the time to patiently answer and explain what we needed to know. Everything looks great and he kept our projects all within our budget! Andy was fantastic to work with. He regularly checked in with us throughout each project and asked that we contact him immediately if we had any problems or concerns. When I had questions for him I could call or text and he responded quickly. Based on this experience, we would hire Kuechle Construction again as well as recommend them! 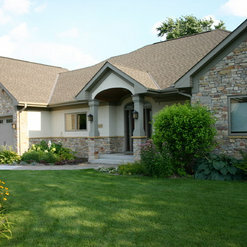 Kuechle Construction built us a brand new home. They were involved in every step of the way ... overseeing the removal of our old house, consulting on the design of our new home, and building a high-quality, beautiful place. They managed all aspects of the building process. They worked closely with us -- listening, making suggestions, and executing what we wanted. They made the whole process a very positive experience. 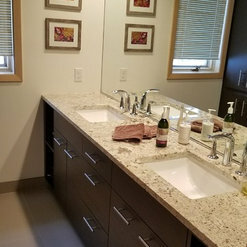 We continue to get compliments on the quality and craftsmanship of their work (especially from construction friends who tell us 'your builder did it the right way'). They also stand by their work and are responsive to address any outstanding needs. We would highly recommend them to family, friends ... whoever needs a house built or remodeled. Kuechle Construction added a four season porch to our home. The final product exceeded our expectations. Their workmanship is exceptional. They were very helpful with making small adjustments as work progressed, and they were diligent with following up on details at the very end. For future projects on our home we will always use Kuechle Construction. I truly appreciated the level of service and professionalism that I received from Kevin and Andrew. 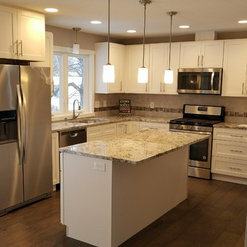 We had Kuechle Construction originally build our home and when we made the decision to remodel (increase the size of our kitchen, along with some other updates) there was no question that we would hire them to complete the remodel. They are honest, efficient and my house looks amazing! 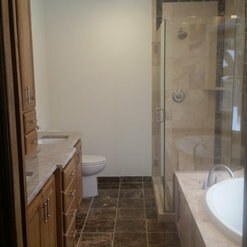 The quality that Kuechle Construction is second to non. These guys have years of experience and it shows in the smallest of details. This is a company I would recommend to my own mother. I look forward to working with you in the near future! Commented: Garage costI believe the garage portion of that project was around $40k. Give us a call if you want the address to drive by and take a look. 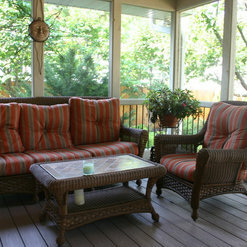 Commented: IS THE SCREENED PORCH WOOD OR VINYL AROUND THE SCREENED AREA?All wood. Although Azek would be OK to use as well for a more maintenance free porch. Commented: Ceiling stain?It is stained. If I remember correctly it is Seikkens Cedar Tone.